Athletes foot is a fungal infection. Fungal spores prefer dark, damp places and the feet, especially areas between the toes, are a perfect breeding ground. In shared communal areas such as sports centre shower areas fungal spores can transfer onto the skin. 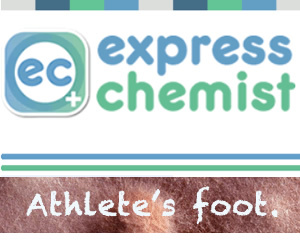 Athletes foot normally between the toes, often between the 4th and 5th toes. However it can easily spread to the soles and sides of the feet. Lamisil Once is a fungicidal treatment for Athletes Foot and is a single dose treatment. Further information about Lamisil Once. Other preparations such as Canesten and Daktarin Aktiv Cream, are fungistatic. Fungistatic treatments such as these inhibit fungal growth and can require daily application for up to 4 weeks or more rather than just one application.